Seen here inside the large arena at the Pennsylvania Farm Show Complex in Harrisburg, Pennsylvania last May 3rd, Kendall Woellmer of West Texas A and M University was as busy as any rider at 2018 IHSA Nationals. Woellmer rode twice the day this photo was taken, earning the Buffs' lone team point with a sixth in team novice over fences. A day later she was third in individual open western horsemanship. Then on May 5th she was fifth in individual open reining while also competing in the rail phase of the individual AQHA High Point Open Rider competition. From Sedona, Arizona, Woellmer finished her sophomore year by placing third in the AQHA High Point after a reining phase score of "142.5." 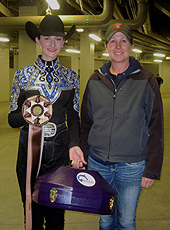 From Pep, New Mexico, Arianne Cox of Texas Tech University (on left, with head coach Danica Jorgensen) won the individual advanced western class held at the Galva, Illinois Semifinal event on March 17th to advance to IHSA Nationals in the division. Cox and coach Jorgensen are seen here underneath the stands at the Pennsylvania Farm Show Complex on May 6th after Cox finished 8th in the same division at 2018 IHSA Nationals. Of the eight individual classes held at Zone 7 Zones in Springfield, Missouri on April 8th only one rider from Region 2 emerged as the blue ribbon winner. That rider is Jessica Johnson of Tarleton State University. From Flower Mound, Texas, Johnson won the individual novice over fences. 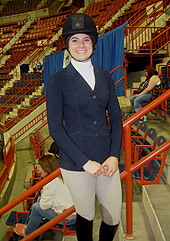 Johnson is seen here on her way to horse draw at 2018 IHSA Nationals in Harrisburg, Pennsylvania on May 3rd. Johnson would place 8th in individual novice fences roughly two hours later. 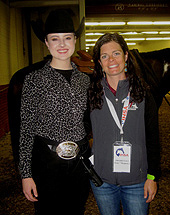 Another West Texas A and M rider who showed both English and Western at 2018 IHSA Nationals is Elora Ellison (on left). From Yukon, Oklahoma, Ellison was 10th in individual walk-trot on May 4th and two days later (when this photo was taken) was sixth in individual beginner western horsemanship. Buffs head coach Amanda Love (on right) has seen Ellison win classes at the higher level so far in 2018-19, as Ellison earned blue ribbons in intermediate western horsemanship on October 20 and walk-trot-canter over the November 17/18 weekend. Schools competing in Zone 7, Region 2 during the 2018-2019 school year: North Central Texas College, Oklahoma Panhandle State University, Southern Nazarene University, Tarleton State University, Texas A & M University at Commerce, Texas Tech University, University of North Texas, University of Oklahoma and West Texas A & M University. was eligible to compete at IHSA Nationals due to rules related to the number of Western riders in a zone and the number of teams allowed to advance to Nationals. West Texas A & M tied Texas A & M for the 2003 Western National Championship. 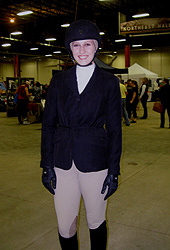 eligible to compete at IHSA Nationals due to rules related to the number of Western riders in a zone and the number of teams allowed to advance to Nationals. Texas A & M went on to win the 2004 Western National Championship.